PHILIPSBURG—The comments “gay cruise” made in Monday’s sitting of Parliament by Member of Parliament for the National Alliance Christopher Emanuel are according to the Tourism Minister, the Honourable Stuart Johnson irresponsible and have offended one of St. Maarten’s biggest International partners in the hospitality industry, the Florida Caribbean Cruise Association FCCA and members of the LGBTQ community. Johnson said Emanuel’s comments puts St. Maarten at risk as this kind of negative and discriminatory comments are heard around the world and harm an already fragile tourism economy. There are lessons to be learnt from the challenges of other Caribbean tourism destinations whose homophobia resulted in physical attacks on visitors and a negative image on their destination. 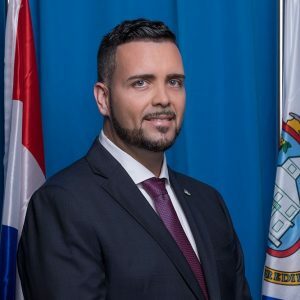 Johnson is calling on the National Alliance through its leader, the Honourable Member of Parliament Silveria Jacobs, to distance herself and the party from the comments made by fellow MP Emanuel, or state for the record that it is the NA’s position to discriminate especially based on “gender expression. The concern now within Government and throughout the community is that MP Emanuel’s comments may have a damning impact on St. Maarten’s image and its relationship with the LGBTQ community and its international partners in the hospitality industry. The Cruise Summit, which Johnson attended, was the recently held PAMAC Cruise Summit consisting of over 100 FCCA PAMAC top executives. He held several meetings with top decision makers in the Cruise Industry to discuss and further develop initiatives for mutual success. His objective was to offer assurance to the Platinum Partners of St. Maarten’s continued commitment to improving its Cruise Tourism Product and to find ways to return our cruise numbers to what they were before September 6th 2017.